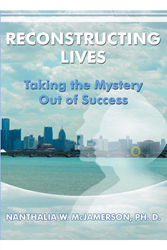 Recent release “Reconstructing Lives: Taking the Mystery out of Success” from Page Publishing author Nanthalia W McJamerson Ph.D. is both cultural and captivating; this book aims to prove to the reader that success is possible. Nanthalia W McJamerson Ph.D., a business woman, counselor, retired professor of Education, co-founder of McJamerson Achiever Builders, and editor and author of educational books, has completed her newest work “Reconstructing Lives: Taking the Mystery out of Success”: a gripping and potent self-help book that breaks down success into six areas: Ability Nutrition, Ambition Ignition, Cardiac Reserve, Apex Nerve, Insight Trams, and Opportunity Rams. Published by New York City-based Page Publishing, Nanthalia W McJamerson’s detailed work is the perfect read for anyone needing the encouragement and guidance for success. Author Dr. Nanthalia W. McJamerson asks readers if they are a “Success Seeker” or a “Success Builder” or both? -providing an opportunity for or destroying an obstacle to someone’s progress today. Readers who wish to experience this inspiring work can purchase“Reconstructing Lives: Taking the Mystery out of Success” at bookstores everywhere, or online at the Apple iTunes store, Amazon, Google Play or Barnes and Noble.